Toyota and Astra Foundation (YTA) proudly present a general lecture to show its contribution in the field of education. Besides donate a unit of Fortuner to Bandung Institute of Technology (ITB) at January 21st, 2015, YTA also held general lecture for students from faculty of engineering. Theme's of the general lecture is "College Student Facing the Future: to be a Global Scale Engineers" with Ir. Made Dana Tangkas, M.Si the Director of PT. Toyota Motor Manufacturing Indonesia and Ir. 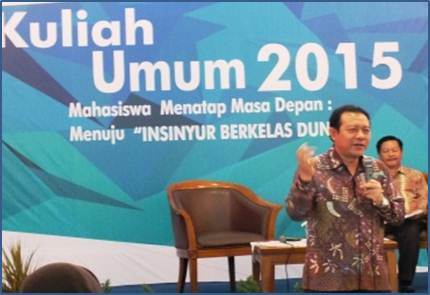 Rudianto Handojo the Executive Director of Persatuan Insinyur Indonesia as the speakers. The general lecture was attended by students and the lecturer of ITB.